14th May: Professor Nav Kapur will give a presentation on ''What's new in suicide prevention research?” at the University of Manchester's Division of Psychology and Mental Health research seminar. 4th April: Professor Appleby will be speaking at the monthly East London NHS Foundation Trust's academic meeting on suicide prevention at St Bartholomew's Hospital. We carried out a detailed mixed-methods investigation into the care of patients with personality disorder who died by suicide or were convicted of homicide. We identified 154 patients with personality disorder who died by suicide (in 2013) and 41 who were convicted of a homicide (between 2010 and2013) using data from our large, national database. We collected information from medical records and Serious Incident reports on 87% of the patients identified, and also asked staff and patients to share their experiences of services via an online survey and focus groups. Our findings highlight that patients with personality disorder who died by suicide or committed homicide were not receiving care consistent with NICE guidance, and there is a need for a more comprehensive examination of services for personality disorder, taking into account the safety concerns highlighted in this report. 5th January: Updated version of our toolkit ‘Safer Services: A Toolkit for Specialist Mental Health Services and Primary Care’ is issued. Our toolkit presents quality and safety statements about clinical and organisational aspects of care, based on 20 years of research into patient safety. The toolkit is intended to be used as a basis for self-assessment by specialist mental health care providers. This version has been updated to include evidence from our most recent data, and new statements about working with carers. 8 December 2017: NCISH are pleased to welcome Jennifer Smith-Merry, Associate Professor visiting from the University of Sydney, Australia. 5 December 2017: Professor Louis Appleby and Professor Nav Kapur join MaSH colleagues at the Manchester Self-Harm Project 20th Anniversary Event, Manchester. MaSH colleagues will be presenting findings from 20 years of research about self-harm in Manchester and beyond. 24th November 2017: Professor Louis Appleby will be presenting ‘Suicide prevention for liaison psychiatrists’ to trainees, new consultants, nurses and other allied health professionals at the Royal College of Psychiatrists 16th Annual Meeting, Wellcome Genome Campus, Cambridge. 22nd November 2017: Cathy Rodway will be presenting NCISH findings from our study of suicide in children and young people at the Association of Independent LSCB Chairs Annual Conference, Crewe Hall. 21st November 2017: Professor Louis Appleby will be speaking at the launch of West Yorkshire and Harrogate Health and Care Partnership’s Five-year suicide prevention strategy, Wakefield. 14th November 2017: Findings from NCISH’s national investigation of suicide by children and young people will be presented by Cathy Rodway at the Joint Regional North West CDOP conference, Bolton. 13th November 2017: NCISH are pleased to welcome Matthew Large, Professor of Psychiatry, visiting from the University of South Wales, Australia. 8th November 2017: Professor Appleby will be the keynote speaker at the 7th Culture and International Mental Health Conference at the Chancellors Hotel in Manchester. 7th November 2017: Professor Nav Kapur will be Chairing and presenting at the International Summit of Suicide Research in Las Vegas. 13th October 2017: Professor Louis Appleby will be presenting at the Royal College of General Practitioners Annual Primary Care Conference and Exhibition, Liverpool: ‘Forward Together: How we lead primary care to the next level’. 8th October 2017: Professor Nav Kapur we be presenting 'Suicide, self-harm and risk in clinical services' at the Royal College of Psychiatrists' Faculty of General Adult Psychiatry Annual Conference in Gateshead. 7th October 2017: Professor Nav Kapur is presenting on self harm at the National Suicide Prevention Group Advisory Meeting. 27th September 2017: Professor Nav Kapur will be presenting ‘Why self-harm matters to suicide prevention’ at Manchester’s 6th International Suicide Bereavement Conference, Manchester. 11th September 2017: Professor Nav Kapur will be speaking at 2gether NHS Foundation Trust, Gloucester, on ‘Suicide prevention in mental health services’. 6th September 2017 Professor Appleby will be presenting 'Suicide by children and young people' at the NO MORE Suicide Annual Summit at the Halliwell Jones Stadium, Warrington. 22nd July 2017: Professor Nav Kapur will be presenting NCISH findings from over 20 years of research in suicide prevention at the International Association for Suicide Prevention (IASP) 29th World Congress, Kuching (Sarawak), Malaysia. We carried out a study of suicide by children and young people aged under 25 in England and Wales during 2014 and 2015. We wanted to find the common themes in the lives of young people who die by suicide, identify possible sources of stress and examine the role of support services. 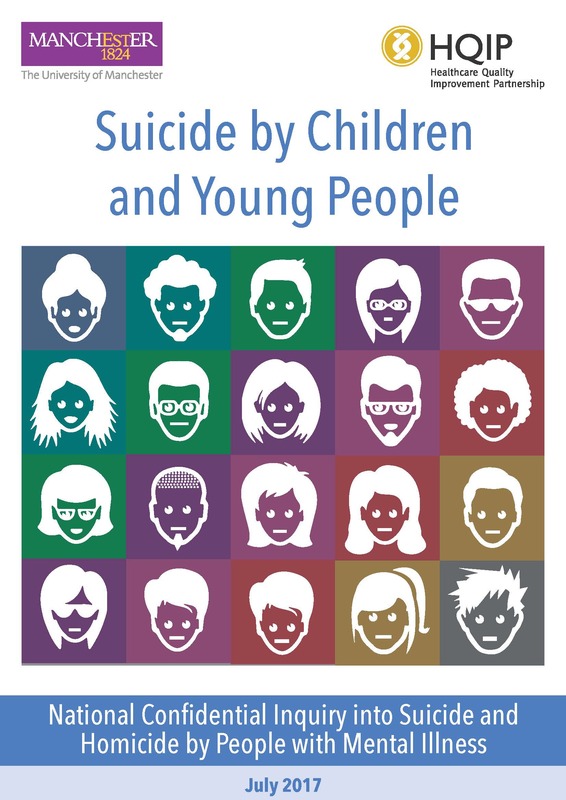 This report covers the second phase of a national investigation into suicide in children and young people. Findings from the first year of data collection (on people aged under 20, in England only) were published in May 2016. We collected antecedent information on 391 people aged under 25. The information came from investigations by official bodies, mainly from coroners, who take evidence from families and professionals. We confirmed in this second, larger study our previous findings of 10 common themes in suicide in children and young people. Our findings also highlight groups where specific actions are needed: support for young people who are bereaved, especially by suicide; greater priority for mental health in colleges and universities; housing and mental health care for looked after children; and mental health support for LGBT young people. 23rd June 2017 Professor Louis Appleby will be presenting and discussing Learning from Deaths at North Regional Mental Health and Learning Disability Event at the Leeds Metropolitan Hotel.23rd June 2017: Professor Nav Kapur will be speaking at the NHS Improvement North Regional Mental Health and Learning Disability Event, Leeds. 14th June 2017: Professor Jenny Shaw will be presenting findings on ‘social care in prison’ at the 17th Annual Meeting of the International Association of Forensic Mental Health Services (IAFMS), Split, Croatia. 14th June 2017: Dr Sandra Flynn will be presenting findings from NCISH suicide and homicide research at the 17th Annual Meeting of the International Association of Forensic Mental Health Services (IAFMS), Split, Croatia. 9th June 2017: Professor Nav Kapur will be keynote speaker at the 2nd Suicide and Self-Harm Early Career Researchers’ Forum, Glasgow. 8th June 2017: Our researchers, Su-Gwan Tham and Jessica Raphael, will be presenting NCISH findings at the 2nd Suicide and Self-Harm Early Career Researchers’ Forum, Glasgow. 18th May 2017: Professor Nav Kapur will be giving a lecture at South Shropshire and Staffordshire NHS Foundation Trust's National Speaker Programme at the Redwoods Centre in Shrewsbury. 2-4 May 2017: Professor Nav Kapur will be giving a keynote address and a series of talks on risk assessment, in-patient care, and interventions for suicidal behaviour at the Royal Australian and New Zealand College of Psychiatrists 2017 Congress, Adelaide, Australia. May 2017: Professor Jenny Shaw will be presenting NCISH findings at the Mental Health Practice, Royal College of Nursing. 20th March 2017: Professor Nav Kapur will be presenting NCISH's findings at the Safer Mental Health Care Conference at The Curve, Prestwich Hospital, Manchester. 3rd March: NCISH have amended their questionnaire and reminder letters. This is in recognition of the very high co-operation that we already get and because we know that staff are under pressure and we need to adequately acknowledge this. 9th January: The National Suicide Prevention Strategy Advisory Group, chaired by Professor Appleby, published Preventing Suicide in England. To view the report click here The report refers to the work of the Centre, including finding from NCISH's latest annual report. June 5: Professor Appleby will be speaking at the British Indian Psychiatric Association's Annual Conference at the Jury's Inn Hinckley Island Hotel In Leicestershire. We carried out an examination of suicides by people aged under 20 years who died between January 2014 and April 2015 in England. This is the first phase of a UK-wide investigation into suicides by people aged under 25. 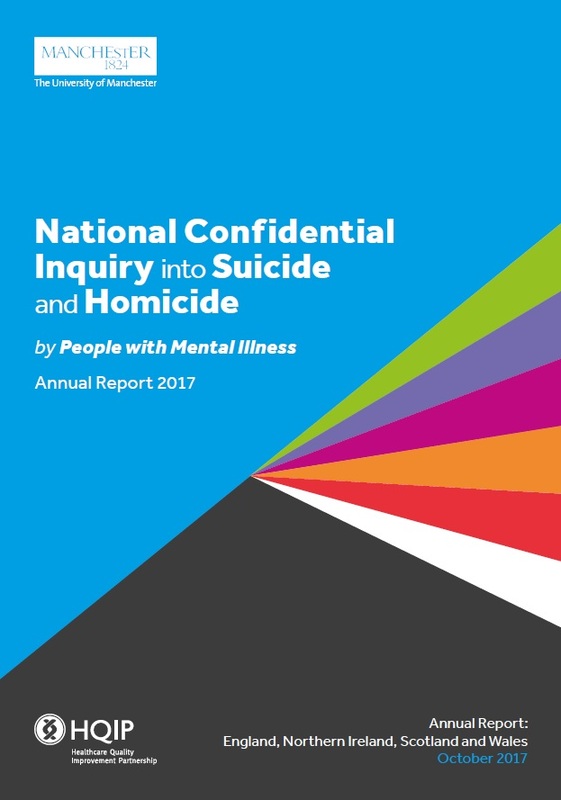 We collected data from a range of investigations by official bodies in England, including coroners, local authorities and health services, and identified relevant antecedents prior to suicide. There were 145 suicides and probable suicides by young people in England in the study period. The suicide rate at this age is low but escalates in the late teens. Our findings suggest that numerous experiences and stresses are likely to have contributed to suicide risk in children and young people. Many young people who die by suicide have not expressed recent suicidal ideas, but their absence cannot be assumed to show lack of risk. Improved services for self-harm and access to CAMHS is crucial, but the antecedents identified in this study show that schools, primary care, social services and youth justice also have an important role to play. To see a video of Professor Louis Appleby presenting the key findings cilck on the following links: Key findings. What do our findings mean for prevention? A linked academic paper ‘An investigation into suicide in children and young people in England: a consecutive case series’ has been published in The Lancet Psychiatry click here. 23 May: Professor Nav Kapur and Dr Sharon McDonnell will be talking about their areas of research at the Pint of Science Festival. As the name suggests, Pint of Science takes place in the pub, with this event at Pie & Ale (Northern Quarter, Manchester) on Monday 23rd May from 7pm. 6 May: Professor Louis Appleby is the keynote speaker at Queer Futures Expertise Exchange Conference: Preventing LBGTQ youth suicide and self-harm held at Lancaster University. 25 April: Professor Louis Appleby, Professor Nav Kapur and Professor Jenny Shaw visit Dublin to discuss national suicide prevention project based on NCISH model. 7 April: Professor Louis Appleby launches proposals from his independent review of GMC fitness to practice processes. Read his blog “Putting mental health safety at the heart of fitness to practice processes” by clicking here. 4 November: Professor Nav Kapur and Dr Kirsten Windfuhr will be presenting at the HQIP Annual Conference in Nottingham today. 23 September: Suicide Bereavement: The Missing Link in Suicide Prevention. The Centre for Suicide Prevention's Third Suicide Bereavement Conference. The conference is now full. However if you would like to be put on the waiting list for any places due to delegate cancellations please contact the Inquiry Office. 21/22 May 2014: Patient Safety Congress, BT Convention Centre, Liverpool. The Inquiry will have a stand, find out more about our work. 18 March: Inquiry Director Prof Louis Appleby speaking at IPCC Mental Health Conference, London - 'Mental health and policing - part of the job'. 19 February: The Inquiry will be presenting 2 posters at Cheshire and Wirral Partnership's Annual Research and Development Afternoon at 1829 Building, Countess of Chester Health Park. New Study: in-patient suicide whilst under observation: We are seeking service user and clinicians' views and experience of observation on an in-patient ward to help inform our study of this important issue. For more information and to participate click here. 27 November Patient suicide: the impact of service changes. Click on image to access the report. 14-15 October: HQIP Conference -Ensuringsafety, driving improvement.Inquiry won the NCAPOP award for Innovative Dissemination. 14-15 October: HQIP Conference -Ensuringsafety, driving improvement, Notts.Prof Nav Kapur and DrK Windfuhr co-presenting session on how clinical audit toolkits can have impact on patient safety. 18 September - Suicide Bereavement is Everone's Business: Policy, Research and Practice (pdf, 625KB) The Centre for Suicide Prevention's Second Suicide Bereavement Conference. Dr Sharon McDonnell to present at the Console World Suicide Prevention conference in Dublin on 9th September. European Research Funding Award to Dr Roger Webb: Understanding the Determinants of Suicidal Behaviour, Serious Accidents and Violence in Young People is a 5-year programme of research, due to commence in early 2014, which is funded by a European Research Council (ERC) award of 1.5 million to Dr Roger Webb. The overarching aim is to identify risk factors that are common across an array of adverse outcomes relating to self-destructive, hazardous and aggressive behaviour, and also those that are specific to particular outcomes. The MaSH Project has published online it's latest newsletter MaSH June 2013 Newspaper. Professor Appleby attends the Samaritans' 60th Anniversary celebration at Clarence House hosted by their patron HRH the Prince of Wales. Follow the links to find a short summary of the rationale and methodology for these new topics of research. 11 February: Professor Nav Kapur interviewed on BBC radio and television following the publication of research into the effects of Government legislation to reduce the pack size of paracetamol showed a 43% reduction in poisoning deaths. 10 February: Dr Sharon McDonnell awarded a Winston Churchill Travel Fellowship. The fellowship award will enable her to visit Australia and New Zealand to learn from their pioneering suicide bereavement services and bring best practice back to the UK. 6 February: Professor Louis Appleby presentation on How can we prevent suicide at the Royal College of Psychiatrists Forensic Psychiatry Annual Conference in Copenhagen. Inquiry online survey seeks views of all stakeholders. NOW CLOSED. 16 November 2012 Professor Louis Appleby presented our recent findings to the national conference of the Forum for Mental Health Nurse Directors and Leads. 8 November 2012 Professor Louis Appleby gave a presentation on suicide to the CPD meeting of the Irish Royal Academy of Medicine. Toolkit based on Inquiry findings made available (pdf,30KB) for mental health service providers to use to help review patient safety. 26 October 2012 Prof. Nav Kapur gave presentation on mental health services and suicide prevention at the Emergency Psychiatry Conference, University Dept. of Psychiatry and Medical Psychology, Ghent. 15 October 2012 Prof. Nav Kapur and Dr Jayne Cooper presented findings on self-harm research to All Parliamentary Group on Suicide and Self-Harm at the House of Commons. Our Parental Bereavement by Suicide Study (pdf, 401KB) team and Survivors of Bereavement by Suicide will jointly lead the Suicide Bereavement Conference (pdf, 619KB) at the University. The keynote speaker is President of the American Association of Suicidology, Dr Michelle Linn-Gust. Parents, health professionals and leading researchers will be coming together to explore the effects of parental bereavement by suicide and to look at new ways to enable health professionals to more confidently support bereaved parents. The event itself is now fully booked but we will be giving more news about the conference on our website, Twitter and Facebook. Come visit our stand to learn more about NCI work and suicide prevention in Manchester @Stockport and District Mind Family Fun Day, 8th September 2012, from 12:00. New findings show suicides under home treatment in England are almost double ward cases. Deaths by suicide among mental health patients treated at home have reached 150 to 200 a year in England, latest national figures reveal but suicides among patients on mental health wards continue to fall. Our annual report recommends mental health services make home treatment teams a priority for suicide prevention. 15 June: Professor Louis Appleby gave a seminar on the epidemiology of violence related to mental disorder at AUSL Bologna. 21 May: The National Confidential Inquiry into Suicide and Homicide by People with Mental Illness (NCI) invites interested parties to submit original topic proposals for consideration as possible forthcoming themed projects. Call for research topics will identify new themed projects to be carried out between 2013 and 2015, to complement our core work. The deadline for submission is 28 September 2012. Suicides by psychiatric in-patients have fallen to a new low, the latest National Confidential Inquiry research has found. The study, one of very few to look at trends over time, shows the rate of suicide among psychiatric in-patients fell by between 29% and 31% between 1997 and 2008 with nearly 100 fewer deaths per year. 13 March: National Study of Presentations to General Hospitals: Conference announced. In England and Wales there are at least 200,000 self-harm presentations (intentional self-poisoning or self-injury) to general hospital each year, and for the past six years the Manchester Self-Harm project has been participating in a pioneering series of related studies on the epidemiology, causes, clinical management, outcome and prevention of self-harm. A conference has been arranged in Derby UK where the findings from this innovative national collaborative study will be shared with clinicians who encounter self-harm and suicide in mental health and general hospital settings, liaison psychiatric staff and those who plan, commission and manage services, and psychiatric and public health researchers. A National Confidential Inquiry study published in The Lancet has for the first time shown a positive link between improvements in mental health services and a reduction in suicide rates. Using nine national recommendations for safer services our researchers compared the rates of suicide in NHS Mental Health Trusts before and after the recommendations were adopted. Those that adopted many saw bigger suicide rate reductions. The recommendations that produced the biggest reduction in suicide rates, when implemented, were the introduction of 24-hour crisis teams, policies for drug and alcohol misuse, and multi-disciplinary reviews after a suicide. 23 November: Professor Nav Kapur chaired the group that developed the new NICE guidelines on the longer term management of self-harm published today. Dr Mohammad Rahman to present at the 7th Annual Suicide Prevention Symposium at the Department of Psychiatry, Penn Hospital, Wolverhampton. The presentation is entitled 'The National Confidential Inquiry into Suicide and Homicide by People with Mental Illness: Recent Findings and Future Directions'. 3 October: The MaSH Project has been joined today by Dr Matthew Haigh who is taking over as Project Manager and by Harriet Bickley who joins the team as a Research Assistant. Matthew completed his Ph.D. in cognitive psychology at the School of Psychological Sciences and has expertise in the areas of reasoning, communication and decision making. Harriet joins the team from the National Confidential Inquiry where her interests included a case control study identifying risk factors for suicide of inpatients and post-discharge patients. 28 September: Dr Kirsten Windfuhr to present at the University of Sheffield's Academic Clinical Psychiatry Research Seminar at the Longley Centre, Northern General Hospital, Sheffield. The presentation is entitled 'The National Confidential Inquiry into Suicide and Homicide by People with Mental Illness: Recent Findings and Future Directions'. 13-17 September: Professor Nav Kapur invited to speak at the 26th International Association for Suicide Prevention Conference, Beijing. Professor Kapur's presentation is entitled 'Health services and suicide prevention: past, present and future'. 8 July: The latest MaSH research study 'First episode of self-harm in older age: a report from the 10-year prospective Manchester Self-Harm project' has been published in the Journal of Clinical Psychiatry. Self-harm is closely related to completed suicide, especially in older age. As empirical research of self-harm in older age is scarce, with no studies confined to first-ever episodes in older age, we examined the clinical characteristics and the risk of repetition in first-ever self-harm in older age. 29 June: The Inquiry's latest major report 'Suicide and Homicide in Northern Ireland' is now available. To download a copy of the full and executive summary please click on the links below. 28 June-1 July: Professor Appleby to receive and Honorary Award from the at the 40th Anniversary International Congress of the Royal College of Psychiatrists in Brighton. Dr Mohammad Rahman wil be presenting on Suicide in Vulnerable Groups. 16 June: Professor Louis Appleby spoke about the Inquiry's findings on suicide and homicide at a Clinical Risk Update meeting organised by Hampshire Partnership NHS Foundation Trust, Eastleigh. 13 May: The Manchester Self-Harm Project (MaSH) have published the latest report on self-harm in Manchester for the period 2008 and 2009. The report provides information on the social, demographic and clinical characteristics of self-harming individuals together with characteristics of self-harm episodes and their management in the Emergency Department. Dr Jayne Cooper, Head of Research for MaSH, said "The rate of self-harm in Manchester has been declining steadily since 2003. Overall rates have continued to decline in 2008 and 2009, however, the rate of self-harm has increased for some male age groups. There has been a significant increase in the self-harm rate amongst males aged 35+ between 2008 and 2009, and in 2008 and 2009 males aged 15 to 24 had the highest rate of self-harm among males overall." 18 April: Professor Jenny Shaw gave a presentation on 'Mental Health in the Criminal Justice System' as part of South Staffordshire and Shropshire Healthcare NHS Foundation Trust's National Speaker Programme, at St George's Hospital, Staffordshire. 2-4 February: Professor Louis Appleby gavethe conference key note speech 'Developments in Offender Mental Health' andProfessor Nav Kapur presented 'Self-harm and Suicide' as a clinical training session at the Royal College of Psychiatrists, Faculty of Forensic Psychiatry Annual Conference, Berlin, Germany. 2 February: Dr Shaiyan Rahman gave a presentation about the Inquiry at a Special Lecture Series organised by the University of Edinburgh. 18 January: Dr Shaiyan Rahman gave a presentation on the research of the Inquiry at a Research Seminar organised by Somerset Partnership NHS Trust. Research award update: The National Patient Safety Agency has awarded the Inquiry the contract to deliver the Mental Health element of its Clinical Outcome Review Programme. 23 November: Dr Kirsten Windfuhr presented Inquiry findings on alcohol and suicide to the Scottish Association for Mental Health Winter Conference, Glasgow Marriott, Glasgow. 29 October: the Inquiry's second report into independent investigations following homicide published. To read the report click here. 29 September: Dr Shayian Rahman presented at the Health and Social Care Advisory Service colloquium Independent Homicide Investigations: Conflicts, Challanges and Opportunities in London. 1-4 September: Professor Nav Kapur chaired a symposium at the 13th European Symposium on Suicide and Suicidal Behaviour in Rome. There were two Inquiry posters (i)The timing of suicide, by Dr David While; (ii) Receipt of treatment by people with depressive disorder: a national clinical survey, Pauline Turnbull. Annual Report for England and Wales June 2010. Professor Louis Appleby gave a presentation about the research of the Inquiry at the conference 'Enhancing understandings and improving practice', University of Sussex, Brighton. Professor Louis Appleby addressed an event examining the reporting of mental illness and risk of violence by the press. Delegates included senior editorial staff and crime correspondents. The event was jointly organised by Shift and the Royal College of Psychiatrists. Professor Jenny Shaw hosted a symposium on the Homicide findings of the National Confidential Inquiry at the International Association of Forensic Mental Health Services Annual Conference in Vancouver. Presentations include Timing of homicide: the temporal patterns of homicide offences presented by Alison Roscoe, A population based study of juvenile perpetrators of homicide in England and Wales presented by Cathryn Rodway, Victims of homicide with mental illness presented by Damian Da Cruz and Filicide presented by Sandra Flynn. 15 April: Visit by Dr Frederick Walberg and Dr Ewa Ness from the National Centre for Suicide Research and Prevention at the University of Oslo. The focus of the visit was to discuss Inquiry methodology. 24 March Professor Louis Appleby announced as the first National Clinical Director for Health and Criminal Justice. For more information click here. 20-24 March: Professor Nav Kapur visited the Victoria University, Wellington, New Zealand as the 2010 Chad Buckle Fellow. Workshops and discussions included: 'Can mental health services prevent suicide?' and 'Managing self-harm in hospital settings and 'Risk and mental health services'. On Friday 24th March he gave the Chad Buckle Fellowship: Public Lecture 'Suicidal Behaviour: Causes and Prevention'. For more about Professor Kapur and the Chad Buckle Fellowship click here. 'Mental Health Reform and Schizophrenia in England' - 6th Annual Meeting of the Research Group for Schizophrenia. 'Recent mental health service reform: results and future vision' - Tokyo, Training Course Conference hosted by the Japanese Society of Psychiatry and Neurology (JSPN); also Osaka & Kobe. 'Suicide Prevention in England', hosted by the Japanese National Suicide Prevention Centre. 28 January 2010 Dr Anna Pearson presenting findings from the Inquiry's study of independent investigations following homicide at 'Embedding the Learning in Mental Health' organised by NHS London. 27-28 January 2010 Visit by Norwegian Government Commission on behalf of the Ministry of Health and Care Services tolearn more about the work of the Inquiry. 10-11 December 2009 Professor Louis Appleby attended 'Prevention of Depression and Suicide - Making it Happen' organised jointly by the Ministry of Health (Hungary) and DG Health and Consumers and in collaboration with the World Health organisation, Budapest. 26 November 2009 Dr Kirsten Windfuhr, gave keynote presentation on the work of the Inquiry. 'Curious Minds' Research Conference organised by the Surrey and Borders Partnership NHS Foundation Trust. 25 November 2009 Professor Louis Appleby, gave the keynote presentation 'Suicide and Homicide: The challenge of prevention'. At the 2nd National Reporting and Learning Service Mental Health Conference, National Patient Safety Agency. 24 November 2009 Professor Nav Kapur present the Inquiry's recent findings on suicide among young veterans at the Combat Stress conference, Manchester Conference Centre. 13 November 2009 Professor Appleby presented 'National Confidential Inquiries into Suicides and Homicides' at the Joint Meeting of CPsychI/European Division (RCPsych), Croke Park Stadium, Dublin. 9-10 November 2009 Dr Anna Pearson presented 'Independent investigations after homicide by People with Mental Illness' at the Patient Safety Summit 2009, organised by the Leeds Partnership NHS Foundation Trust. 1-2 October 2009 Professor Appleby attended the World Health Organisation 'Mental Health Gap Action Programme (mhGAP)', Geneva, Switzerland. More information. 4th International Conference on Child and Adolescent Psychopathology. Roehampton University, London - 13th to 14th July 2009. Inquiry presentations: 'A population-based study of juvenile perpetrators of homicide in England and Wales', Ms Cathy Rodway; 'Suicide in children and adolescents in the UK', Dr Kirsten Windfuhr. National Patient Safety Agency: Rapid Response Report - Preventing harm to children by parentls with mental health needs. Issued to mental health trust Chief Executives May 2009. More information: Rapid Response Report RRR supporting information. Professor Louis Appleby invited as keynote speaker at Substance misuse, mental health and offending meeting. Sussex Partnership NHS Foundation Trust and Sussex Police, Slaugham Manor, West Sussex - 5th June 2009. Professor Louis Appleby presented 'Public safety and inquiry culture'. Royal College of Psychiatrists AGM - 4th June 2009. Inquiry publication: Suicide pacts in the mentally ill: A national clinical survey. Hunt, IM., While, D., Windfuhr, K.,Swinson, N., Shaw, J., Appleby, L. & Kapur, N. Psychiatry Research (2009) 167, pp131-138. For abstract see Inquiry publications 2009. Inquiry publication: Suicide after leaving the UK armed forces - a cohort study: Kapur, N, While, D, Blatchley, N, Bray, I & Harrison, K; PLOS Medicine (2009): Vol 6, Issue 3. Press release. Professor Louis Appleby gave a Keynote Presentation at the Men's Mental Health Conference on 3rd March 2009 organised by The University of Reading, Berkshire Healthcare NHS Foundation Trust and the Charlie Waller Institue. Professor Appleby will present "New Horizon's: What next on Mental Health Reform".More information. Professor Nav Kapur gave the keynote presentation at a National Suicide Research Foundation seminar, "Identifying High Risk Groups to Prevent Suicide - The National Confidential Inquiry into Suicide and Homicide in the UK" University College Cork, Ireland. Professor Louis Appleby CBE presented at the National Patient Safety Agency conference Patient Safety in Mental Health: Driving Seven Steps for Safer Services, Leeds, 26th November. More information. The paper reports a declining rate of young suicide between 1997 and 2003. For further information see press release. Professor Louis Appleby invited to give presentation on suicide prevention at the Institute of Social and Preventive Medicine, Lausanne, 15th October. Ethnicity findings presented in Hong Kong. Dr Jayne Cooper, Head of Research for the Manchester Self-Harm Project is to present some key findings from the project's work on ethnicity to the 3rd Asia Pacific Regional Conference of the International Association for Suicide Prevention. Report for the Scottish Government:National Confidential Inquiry into Suicide and Homicide by People with Mental Illness: Lessons for mental health care in Scotland'. The Inquiry's fourth major report focusing on suicide and homicide in Scotland. The full report, summary report and press release are available as PDFs to download. MaSH Publication: Hospital care and repetition following self-harm: multicentre comparison of self-poisoning and self-injury.